Everyone’s juggling a lot these days. And there’s nothing as satisfying as finding a key piece of software to help lighten the load. 2Do, a new entry to Setapp, is a full-featured task list that’s powerful enough for a full Getting Things Done workflow, but also flexible enough to conform to however you like to work best. In fact, 2Do has all the power of task managers like Cultured Code’s Things, and The Omni Group’s OmniFocus. Apple named 2Do for Mac a best app of 2013, and Federico Viticci of MacStories named the iPad version an app of the year in 2015. Now that it’s part of Setapp, we think you’ll love how productive 2Do can make you. Here’s just a sample of 2Do’s best features. It definitely checks all of our boxes, and we hope you like it too. Capturing tasks needs to be quick and easy, so when something pops into your head, you can make a note of it and get back to work. 2Do lets you set a universal shortcut for Quick Entry that works anywhere, even if 2Do isn’t open. You can just type a few words and save it to your Inbox to fully process later, or you can fill out the entire form, complete with details, tags, a due date, and so on. Since it’s just a floating window that pops up on its own, Quick Entry also lets you capture tasks without having to look at the rest of your 2Do lists. In fact, the Quick Entry box can even auto-fill with whatever’s in your clipboard. (Turn that option on in 2Do > Preferences > General.) That way, you can copy any text from anywhere on your Mac, then hit the Quick Entry shortcut, and the text you copied will be filled in, saving you a step. Speaking of the Inbox, in 2Do it’s optional. Some people just want to make lists of tasks, and might not need an inbox. But to follow David Allen’s method outlined in Getting Things Done, the Inbox is the dumping ground for anything on your mind, whether it’s a task, a reference item, or an idea for something you might want to do later. Everything gets collected in the Inbox, and then once a day at least you process your inbox, looking at each thing there and deciding if it’s an action item that would get filled out and moved to a to-do list, a reference item to save, an event that should go on your calendar, and so on. 2Do has a utility panel on the right side that lets you see your tags (which can be grouped together) and Nearby locations. Then you can just drag and drop tags onto your tasks, or tasks onto your tags. Tags make it easy to add context to your tasks and quickly find the tasks that you’re best equipped to tackle at a given moment. For example, say you have a little time to kill but not enough to dive into a big project. You could check out your tags for phone calls or email, to see if there’s a task to return a message. Before you head out, you could quickly review the tasks in your “Errands” tag group, to see if you can knock out a few errands in one trip, even if they’re part of multiple projects. You can’t let your to-do list be the place tasks go to die, languishing at the bottom, every day getting more and more buried by new priorities. 2Do’s sort options let you look at your list in a new way, which could jog your memory or spur you to action—or maybe help you decide which tasks could be delegated or just removed from your list altogether. In the drop-down menu in the upper-right, you can sort manually of course, or by priority, start date, due date, creation date, location, tag, and more. Every task list has due dates, but only the best ones also include start dates, and that includes 2Do. When you give a task a start date, it will pop up when you need to get started, but until then you don’t have to see it or even think about it. If you use the Getting Things Done method, this is the “tickler” file, designed to keep upcoming tasks from cluttering your mind until they need to. Some tasks might get start dates but not due dates. If tickets to a show go on sale July 1, you could buy them anytime between July 1 and the date of the show. When you set the start date at July 1 and the due date, say, the day before the show or even the day of, you won’t have to think about getting tickets in June, but you won’t be pestered with a “late” task if you don’t get around to buying them until July 3. You could even add a start date to be reminded of a task in the future, and then choose a deadline at that later date. This is where 2Do can really save you time—time spent tinkering with your task list! It’s vitally important to capture every task completely if you’re going to rely on your 2Do list to remember things and trust it to be accurate. But if actually managing that data entry and organization becomes a pain point, you may not stick with it. 2Do lets you select multiple tasks and then press D to Defer, which pushes the start date out, or K to Schedule a new due date. More keyboard shortcuts are visible under Tasks in the menubar. Each task has a row of buttons for things like adding a photo, recording a voice memo, adding a location, repeating a task, and setting a start and due date. In the middle of that row is a button that looks like a clapperboard from a movie—you know, “Action!” That’s the Action button. Click the Action button, and you can add a URL, search Google, add an address, send this task by email or SMS, or even make a phone call right from 2Do. The global search bar at the top of 2Do has incredibly granular options to let you find every task. If you need to find work tasks due next week and marked high priority, or family tasks that have been sitting on your list for a while month, you can find them easily. The search bar even lets you search with operators. You could search for tasks with either of two tags: groceries OR errands. Or even exclude tags: (home OR play) AND !work. There’s even a secondary search bar at the bottom of the window that lets you drill into the current view. In other words, it only searches what you’re already looking at. So if you’re in your Today view, or a specific Smart Folder, or even some search results, and you want to find any tasks with your boss’s name, you can use that quick-find bar to highlight those without changing the view. As powerful as the search function is, no one wants to have to run the same searches over and over. 2Do lets you save a search as a Smart List—the concept should be familiar to anyone who ever used a Smart Playlist in iTunes. The app gets you started with a Smart List for tasks due in the next 3 days, and it’s easy to make your own. Just perform a search, then click the gear button to the left of the search bar to save it as a Smart List, which show up in their own section of the sidebar on the left. 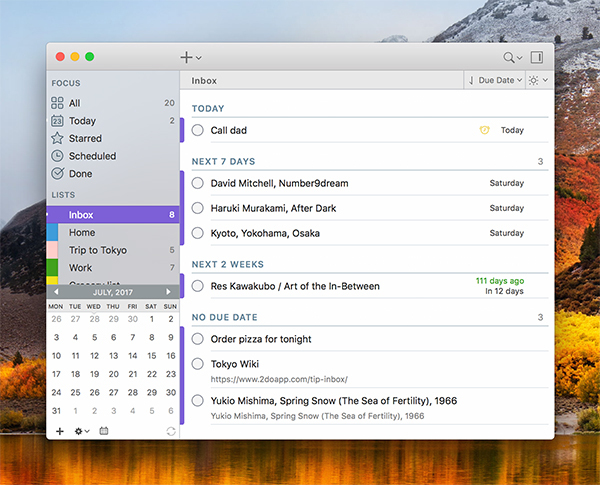 The integrated calendar in 2Do pops up in the bottom-left of the window when you click the Calendar button. 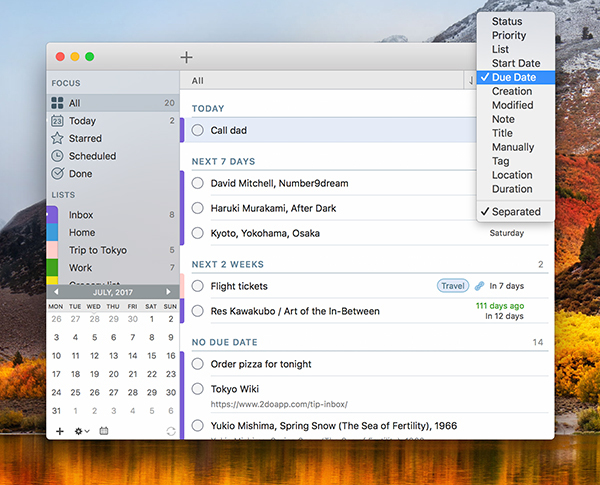 When it’s open, you can drag tasks onto a calendar date to defer them. You can select dates on the calendar to see just the tasks scheduled for those days. Or you can hold down the Option key and click a date on the calendar to create a new task on that date. 2Do has an iOS app too, and naturally your tasks sync back and forth flawlessly via Dropbox. If you have the iOS app, you should consider tagging your tasks with locations. 2Do’s locations panel lets you set up a list of locations where you need to do things, complete with addresses. Sure, you could just use tags, but the advantage of real locations is that your iPhone knows where you are, and 2Do can then alert you to tasks that are nearby. Say you’re picking up your kids after school, and you’ve got a task in your list that needs to be completed a block away. Bloop, you’ll get a push notification. This saves you not only gas, but a lot of time running back and forth. Deep integration into macOS? Check. 2Do has a widget for the notification center that show your Today list, plus your Starred list and even a custom list you choose. It also has a Share extension, which will come in handy again and again. You can click the Share button in Safari, for example, and choose Add to 2Do from the menu. Or highlight some text in an email, right click, and select Add to 2Do. Privacy: 2Do lets you set a passcode for the whole app, or just for individual lists. It even supports Touch ID on the newest MacBook Pros! Cleanup: In the preferences, you can have 2Do auto-delete completed tasks after a certain time to keep them from piling up indefinitely. Dock count: The badge on the Dock icon can show how many tasks you have today, or today + tomorrow, overdue, high priority—even everything due in the next year if you’re an incredible overachiever. Keyboard shortcuts and Touch Bar support: 2Do has tons of shortcuts for keyboard commandos, but if you don’t want to memorize them, the Touch Bar puts often-used buttons at your fingertips too. Multiple sync options: You can sync 2Do across multiple Macs, iPhones, and iPads (or even Android devices!) with Dropbox. 2Do also syncs with Toodledo, which has a browser-based version. Or you can integrate with your iCloud Reminders thanks to CalDAV support. Auto backup: You can have your 2Do lists backed up at regular intervals, which is really helpful if you lose or break a device. Go ahead, put “check out 2Do” on your task list. You won’t regret it.